Just how much would you pay for a cask of rare Scotch whisky? For some, it seems, the sky is the limit when it comes to liquid gold. Earlier this month, an anonymous buyer in Hong Kong paid an auction-record £285,000 for a sherry cask filled with a 30-year-old Macallan single malt. Its contents, if emptied, would work out at a neat £1,000 per 70cl bottle. Others have paid even more for a cask of the hard stuff, with one Scotch whisky brokerage reporting a sale in excess of £500,000. 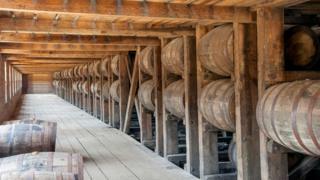 Some industry experts believe there are £1m casks out there waiting to be found. So why are people willing to spend such eye-watering amounts of money on the spirit? For some, casks are merely an investment. For others, such as connoisseurs and collectors, there's more emphasis on the experience - tasting a spirit that has been ageing in oak casks for decades. But rarity is also highly prized. That may sound strange when an estimated three billion litres of the spirit is busy maturing in storage - enough to fill 1,200 Olympic-sized swimming pools. But in reality much of it is relatively new - bearing in mind that it requires three years of maturation before a spirit can legally take on the name Scotch. Those operating at the top end of the market - the really rare stuff - say there is no shortage of interest from potential buyers. Analyst and broker Rare Whisky 101 (RW101) has noted increased demand for "quality casks" from connoisseurs, collectors and investors. The Dunfermline-based firm, co-founded in 2014 by Andy Simpson and David Robertson, says its past deals with brands such as Ardbeg, Laphroaig, Macallan and Springbank have achieved an average cask price of more than £130,000. Mr Simpson says buyers are drawn by "rarity and uniqueness". He explains: "The vast majority of distillers will not part with aged stock as it's too important for them to maintain the brand. "If they do allow cask sales, as with Diageo's Casks of Distinction programme, these are, again, exceptionally rare. "It's also about the unique factor of cask ownership - no two casks are the same - so they're truly unique. "We've tried many concurrently numbered casks, distilled on the same day, filled into (theoretically) identical casks and the samples are hugely different." But Mr Simpson also makes the point that while older casks can bring greater rewards - they also bring bigger risks. He explains: "With older casks, there's a risk they drop to below 40% ABV (alcohol by volume), the legal minimum for spirit to be called Scotch. "If that happens then the cask becomes worth a fraction of its former price. "A couple of years ago we got excited by a 49-year-old sample coming through. On paper it should have been the oldest ever expression from the distillery of origin. "When the sample arrived it was like Castrol GTX - thick, viscous, green gloop. And with an ABV of just 28%, it was worthless." He adds: "Casks do also evaporate, so the longer it's left, the fewer bottles will be yielded upon bottling. "The first rule of buying Scotch as an investment is to make sure it's exemplary quality. "One person's investment today could be - and frequently is - another's favourite drinks cupboard dram tomorrow." Although rare casks are highly prized by collectors, connoisseurs and investors alike, the marketplace for people with less deep pockets also appears to be thriving. One whisky specialist has been tapping into the market by appealing to investors who don't feel the need to touch, smell or even taste the product. Whisky Invest Direct launched an online trading platform for Scotch two years ago. Describing itself as a "stock exchange for whisky", the company allows private investors to buy and sell Scotch whiskies early in their maturation process. The firm now has 4,500 whisky accounts with more than £12m invested in 3.5 million litres of spirit. Chief executive Rupert Patrick, a former director of whisky giant Diageo, says: "Buying maturing stocks of whisky on our platform has allowed investors to enjoy net returns of over 7% per year since we launched two years ago. "Two of the key benefits that we offer investors are that we give them access to an un-inflated tangible asset, and our market place is very liquid - a 24/7 trading exchange." Image caption Strathearn Distillery founder Tony Reeman-Clark says customers "want something that is unique"
Although the big whisky firms hold the lion's share of the 20 million or so casks currently stored around Scotland, smaller craft distilleries are now eyeing what they see as a gap in the market. They include Perth-based Strathearn Distillery, which prides itself as being "probably Scotland's smallest distillery" with a capacity of just 10,000 litres. Founder and owner Tony Reeman-Clark argues that small is beautiful when it comes to meeting customers' tastes. He says: "We have found that people want a strong provenance, something that is unique, and there is no better way to do that than buy your own cask of whisky from a craft distillery. "If you buy a hogshead cask, you will end up with 300 bottles and they are all the same. "But because we are a small distillery, we generally offer casks with only 40 or 50 litres of whisky in them. "We have had customers buying two or three of them at one go - casks with different finishes, such as sherry or brandy, so they can experience different tastes." Mr Reeman-Clark says the firm has attracted customers from as far as Germany, Sweden and the Far East. He adds: "People buy our casks for a wide range of reasons - for example, for their children, for investment purposes and even for weddings. "We had a group of oil workers here recently who refilled their cask with peated spirit after finishing the first batch. "They know they are welcome back anytime to taste the spirit so they have a good idea of what it will be like when they are ready to bottle it."